Have you ever taken a beautiful photo that you wanted up on your wall as large custom canvas prints but you weren’t sure how to do that? 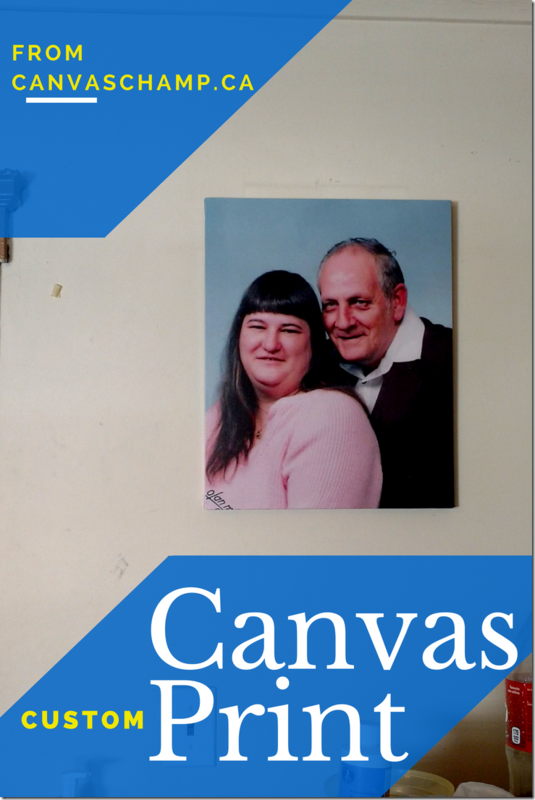 CanvasChamp will take your uploaded photo and create the print for you and ship it directly to your door – SO EASY! Disclosure: I received compensation in the form of product and/or money in exchange for an honest review. Getting my custom print was easy as pie. I used their website to choose the size I wanted, what photo I wanted them to use (uploaded from my computer) and I chose from a few extras. They took it from there and created the print and mailed it directly to my home. The shipping really wasn’t very long. The prices are great. For the size I got (16×20”) it was only $16.00 CAD! We chose to get a custom canvas print of my in-laws who passed away years ago. It’s a great way to keep them in our memories now that they are sitting in our living room. Canvas prints aren’t the only thing CanvasChamp can provide. They also make metal or acrylic prints, custom photo pillows (throw pillows with your photo on it), split canvas prints (one photo spanning across multiple canvas prints) and photo books or calendars for gifts. I was very impressed with the quality of the print. It was very tightly attached to the wood, it doesn’t look like it would come undone. Everything looks great and I’m glad to have it as the centerpiece of my living room. I can’t wait for visitors to see it. I definitely plan to get another print from them in the future. I’ve always wanted more photos on the wall and I think they look better as a canvas print than just a photo in a frame. Be sure to check out CanvasChamp.